103 years ago this month, America’s horses and mules began their one-way journey to the battlefields of World War One. 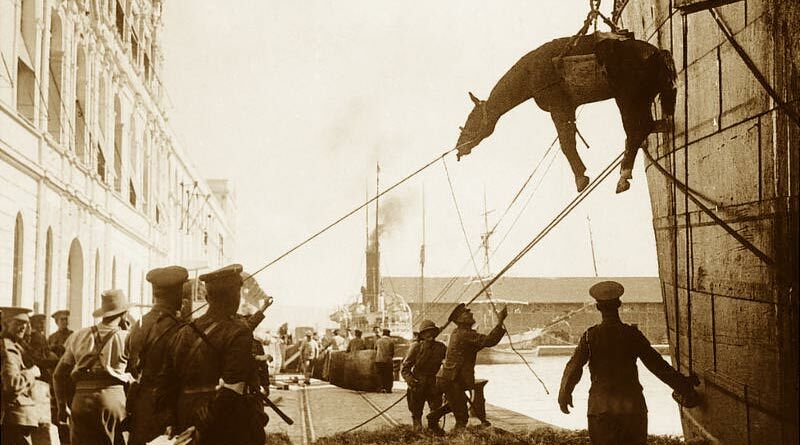 Some 103 years ago this month the first of America’s horses and mules exported to join the World War One war effort in Europe left their homes. This year marks the 100th anniversary of the US entering WW1, and Brooke USA’s Horse Heroes campaign has raised nearly $900,000 of its million-dollar goal to honor the memory of those horses by raising funds to improve the welfare of working equines around the world. Brooke USA is raising one dollar in memory of each of America’s horses and mules who served in World War I. Once bought for the war effort, the US horses and mules endured a strenuous journey that included traveling to a seaport and shipping in cargo holds across the Atlantic. After several weeks at sea, the animals were admitted to quarantine upon arriving in England. They were shod and kept at remount stations to recover from their trips overseas before they began their formal training as war horses. The contributions of equines in WW1 were immeasurable, and the number of equine lives lost – some eight million – was just as significant. Equines were a crucial part of the war effort, as they carried soldiers into battle and injured men to safety. Horses also hauled military supplies such as medicine, food, water, ammunition, guns and other necessary resources to the front lines. The horrific smells, sounds, sights and the suffering that they endured alongside their soldiers can only be imagined. Sadly, most of the horses and mules who survived the war were later sold for slaughter or hard labor in the foreign countries where they served. As a result, Dorothy Brooke, the wife of a British Army officer stationed in Cairo, Egypt, began her lifelong mission to rescue these equine war heroes, and start the organization that is now the world’s largest international equine welfare charity, Brooke. Today more than 100 million horses, donkeys and mules in the developing world have similar jobs and suffer similar fates as the war horses as they labor to provide a livelihood for 600 million of the world’s poorest people. The majority of these equines experience chronic suffering and early mortality rates. Exhaustion, dehydration, crippling injuries, lameness and disease take their toll on nearly 80 percent of working equines in the developing world. A 1934 book about Warrior was republished in 2011. Brooke USA’s Horse Heroes campaign, an official Centennial Partner of the US World War One Centennial Commission, will fund equine welfare programs to assist many of those animals and families. To date the campaign has raised nearly $900,000 toward their goal of one million dollars – one dollar in memory of each of America’s horses and mules who served in World War I. From now through the end of the year, each Horse Heroes donor of $250 or more will receive the book, Warrior: The Amazing Story of a Real War Horse, by General Jack Seely, with illustrations by Sir Alfred Munnings. The book was first published in 1934, and reprinted in 2011. This year a special First World War anniversary edition has been released. In 2014 Warrior was honored with the animal equivalent of the Victoria Cross. The PDSA Dickin Medal is a large, bronze medallion bearing the words “For Gallantry” and “We Also Serve”, all within a laurel wreath. The ribbon is striped green, dark brown and pale blue representing water, earth and air to symbolise the naval, land and air forces. Warrior’s medal also features a bronze “Honorary” bar on the striped ribbon. Since its introduction it has been awarded to 29 dogs, 32 World War 2 messenger pigeons, three horses (not including Warrior) and one cat. Thank you for this lovely, sad portrayal of all the millions of horses who sacrificed their lives so we could be free today. I’m glad there is this fund set up to help the plight of working animals in 3rd World Countries. Unfortunately, it’s happening too often in the United States as well. Carriage horses being the main one. With the end of WW1, there was not enough food for the peoples to eat. Everything had been destroyed so the people had to turn to horses for their food. One can not blame them as they had to survive. The countries that consume the most are Germany, Belgium, The Netherlands, Poland, Russia & France. Unfortunately, this has carried on to this day. Now they are kept on feedlots to fatten up & then flown for over 36 – 40 hrs, alive, in these little crates over to Japan. There are over 150,000.00 horses each yr. sent to slaughter & 5 flights a day, loaded with 12 or more Draft horses, more meat, per day out of Calgary & Vancouver Airports each day. I am not taking away from the heroic deeds done by these magnificent horses during this horrific War. If it weren’t for the horses the Allies would probably not have won the War. I’m trying to draw attention to the plight of these horses today. I am very pleased that Brooke has a foundation set up to help the underprivileged horses, donkeys & burros of today. People have to be educated how to treat their horses. a lot of these people need those animals to survive. There is also another threat to them as China has been buying millions, I’m not exaggerating, of them for their own use in medical cures, not proven, skins & meat. We need to draw attention to this fact also. I hope I haven’t frustrated you with my comments, but I just had to let you know what was happening around the World & in Canada. Again. congratulations on a job well done. I iv read a article stating that our wild ponies in the U.K. are culled slaughtered and sent to Europe as food.